When you’re in Banaue, Sagada, or any other destination in the Cordilleras, you’re immediately welcomed to cool climate, mountain ranges, and rice terraces -- the perfect environment for trekking. But what if you’re not into trekking? 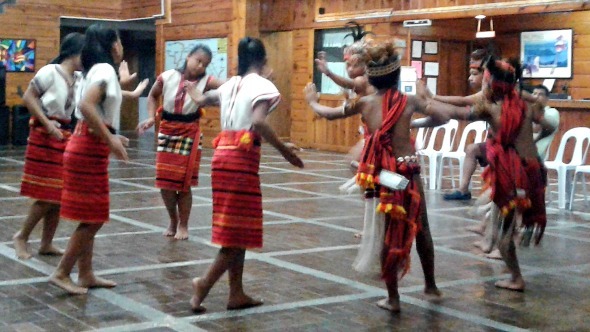 If you happen to book a stay at the Banaue Hotel and Youth Hostel in Banaue, Ifugao, you’ll have the opportunity to catch a free cultural show at the hotel lobby and even participate in the Ifugao tribal dances and reenactments of their ritual called Punnuk to mark the end of their people’s harvest season. Cultural shows take place at night so it’s best to head immediately to the lobby after dinner. Banaue Hotel’s lobby has wifi access so most hotel guests like staying there to post Snapchats or Instragram stories of the dances, recent travel photos or even send a quick e-mail to their bosses. While your friends go hiking, you can spend your time meeting new people. I met a seven-year-old boy named Schwarzenegger (yes, that’s his real name) while my companions were exploring Hungduan Rice Terraces, one of the five terraces inscribed in the UNESCO World Heritage list. I was waiting for my companions in Nayaflor’s Lodge in barangay Hapao when this kid approached me and offered to keep me company on the porch swing while I waited for my friends to finish their trek. We were later joined by Schwarzenegger’s friend, Zia, who is a year younger than him. The two kids told me all about how they had to hike every single day to their school and how it was too easy for them they could do it with their eyes closed. I also got to meet one of the barangay councilors, 50-year-old Evelyn Balenga, who also owns a sari-sari store. She invited me inside her home. Evelyn says that the temperature in Banaue hasn’t been as cold as before and I agreed, even though the weather was already chilly enough for someone who easily got cold, like me. Arlene Akiate, one of the tour guides who accompanied me while the others were trekking invited me to return to Banaue on August to attend the Punnuk Festival, a thanksgiving ritual after rice harvest. Rent a jeep or van to take you to the peak of Mt. Kiltepan in Sagada, said to be one of the best places to wait for the sun to come out and get a view of the rice terraces below. Visitors would not need to hike or trek as the vehicle already takes you to the peak itself. Although already popular among both locals and tourists, the site gained even more popularity by the romantic comedy film “That Thing Called Tadhana”. Word of caution, contrary to what was shown in the film, shouting is not advised. The downside of a famous tourist destination is that it sometimes suffers from overcrowding, which could sometimes interrupt what should be a serene moment. To get a good view of the sunset, it’s best to be there on or before 4 a.m. It could get quite chilly, so visitors weak in the cold are encouraged to bring thicker clothing. When we visited the place, it was around 16 degrees Celsius. While waiting for the sun to come out, visitors could also sip hot Sagada coffee sold by vendors for more or less PHP50. They also sell hot food—champorado, arroz caldo and instant cup noodles. There are some tables and chairs a few strides away from the actual viewing deck so visitors won’t have to worry about missing the star attraction. Recreate the famous pottery scene from the 1990 film Ghost by attending a pottery workshop in Sagada Pottery Training Center located in the municipality of Poblacion. The center is run by Tessie Baldo, one of the center’s first apprentices. Although 58-year-old, Tessie’s hands do not quiver. In fact, she molds the clay with masterly finesse. For a PHP100 fee, visitors willing to get their hands dirty can also try out pottery. In case guests go hungry, home-made whole wheat bread in three flavors—cheese, chocolate and cinnamon—is also available at the center for PHP25 each. According to Tessie, the center is the brainchild of American potter Archie Stapleton who started the training center in 2000. His parents were assigned in Sagada as missionaries of the Philippine Episcopal Church in the 1960s but it was not until four decades later when Archie returned to Sagada to assemble a pottery workshop and give formal instruction to a small group of local artisans—some of them now manage the center themselves. Ask owner-curator Lester Malidong how many sculptures, jewelry and other artifacts are housed in the Ganduyan Museum, and he’ll reply with “I don’t know, we don’t really count.” Lester’s late mother, Christina Aben, is an artist who started collecting Northern artifacts of the Philippines until she finally had enough to open a small but cozy museum. For only PHP25, visitors can enter the museum which houses all sorts of items once used by the Igorot people or mountain dwellers—a necklace made of snake vertebrae, wood sculptures of their rice god known as bulul, furniture with legs carved as monitor lizards, rice baskets, skulls of animals to name a few. Lester shares that although there have been offers by both the government and a private company to buy his museum for a price that “could last a lifetime,” he did not have the heart to sell it because it was his mother’s legacy. If in Baguio you go strawberry-picking, in Sagada, you go orange-picking or more specifically, using shears to cut them off. The best place to have your orange fix is the orange orchard in Rock Inn, only 10-minute drive away from Mt. Kiltepan. For only PHP50, visitors can enter Rock Inn’s orange orchard and start picking oranges and even get to drink them as pure, freshly squeezed juice. Fely Omengan, founder of Rock Inn, says she decided to open her orchard to the public for orange picking in 2014. It was the same year when tourists started coming. She says orange picking season is from October to January. Why oranges? She says it’s just something that came to her mind.